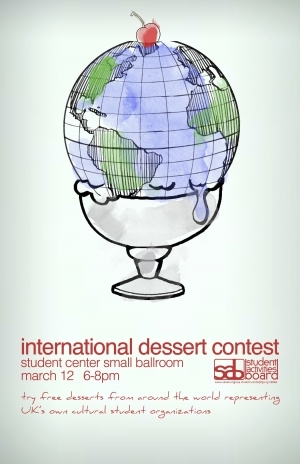 (March 12, 2014) — Time to take a bite of the world at the second annual International Dessert Contest hosted by the Student Activities Board’s Multicultural Affairs Committee. The event will be held at 6 p.m. today, Wednesday, March 12, in the Student Center Small Ballroom and will feature desserts worth a thousand bites. Organizations that embody different cultures submit recipes that will be executed by UK Catering. A panel of judges as well as the audience will then judge the dishes, and a winner will be selected. This event serves as a fun way to educate people about different cultures and foods, and it also serves as a way for students to socialize and congregate. What can students, faculty and staff expect? According the Multicultural Affairs Committee: more food, more cultures and more fun! SAB brings more than 100 entertaining, educational and enriching programs that are reflective of contemporary issues and trends to the University of Kentucky annually. These programs are designed to enhance the college experience for students, faculty, staff and the greater Lexington community. Connect with SAB, follow them on Twitter or like them on Facebook. For more information about SAB and events, email contact@uksab.org or text a question beginning with SABQ, followed by your question or comment, to 411-247.